I saw her going in and out of the hole, then dragging the cicada down the hole, and then heard awful BUZZZZZZ BUZZZZZZZZ sounds coming from the hole, and she left. I have two other pictures. Thanks for the very nice photo. Unfortunately, that is not a cicada killer wasp but another kind of burrowing wasp known as the Great Golden Digger wasp Sphex ichneumoneus. 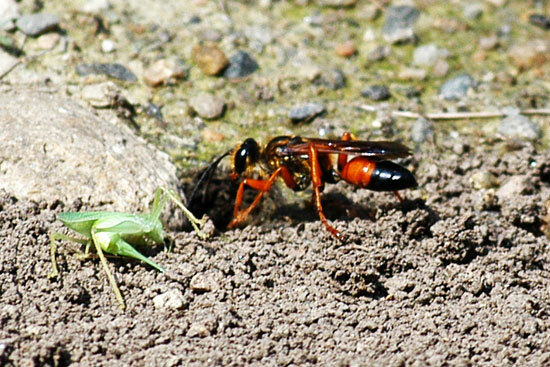 Generally, these wasps do not prey on cicadas however, they LOVE katydids. If you look at your photo, to the left is what looks like a recently paralyzed katydid. Like cicada killers, female Golden digger wasps sting their prey only to paralyze them. They then lay an egg on the paralyzed victim and then when the egg hatches, the larva eats the paralyzed insect. I have seen Great Golden Digger wasps take many katydids. Thank you. I already figured that out, but couldn't��t “undo” the email. I posted the pictures and story of Sphex ichneumoneus on my blog; The Nature of Framingham. You’re welcome to take a look. Thanks for replying. I appreciate it.